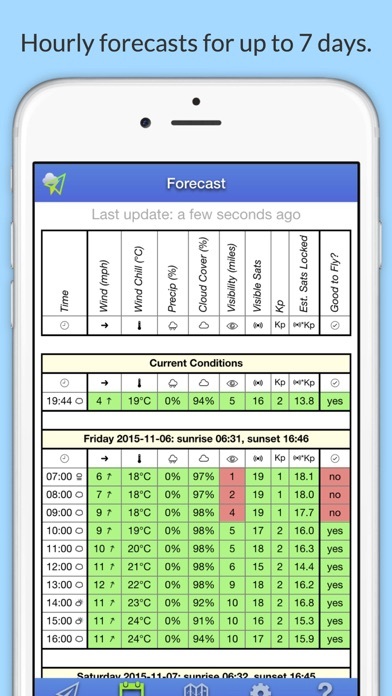 This App works great to check weather conditions. Be careful though because the upgrade button is very close to the home button. I have no problem supporting developers for their hard work but accidentally paying $23.99 for an upgrade? Maybe a bit steep in my opinion. Just loaded the latest version. Only large airports show up on map regardless of my threshold settings. Noticed it on last version too but this fix came out quickly. This app which was my go to is now undependable. This app is really great. With one tap, you are displayed with the local conditions you care about before you fly. It is presented in an easy to understand, unobscured format that will let you know within seconds if you’re good to fly. The app is simple, clean, accurate and easy to use. It provides the average enthusiast with everything they need to check before flying all in one convenient space. Not to mention, it’s customizable to fit your needs or the restrictions of your UAV. Can’t recommend this app enough. It’s just what I was looking for. I will continue to recommend this to all UAV users. Simple easy to use awesome. The developer just released a patch because one guy complained about the app not working on iOS 9 anymore! Talk about quality customer service. The app itself is great and can be understood in a moment with easy green or red colored sections. If you’re a UAV enthusiast pick up this app, you won’t regret it. After the update it only opens to a blank white screen....? What's up with that??? Please allow map to zoom out further as to see a bigger overview. Latest Update Puts A Sneaky $24 Purchase Up!!! I have been using UAV Forecast for a couple weeks and generally liked it. After updating last night, I went to open it and check wind conditions for today. Without tapping ANYWHERE, the app put up a confirmation to purchase the $23.99 "Hobby Subscription" at the same time I was pressing the home button to go back to the home screen. I'm an app developer myself and have no problem paying for apps, but this was SO scummy ... avoid this app AT ALL COSTS. I intend to wage war against this app with Apple and on every drone forum possible. The colors for the NFZ are too close to the same color. Hard to read what zone is what color. Needs updating. Nothing in the app will load since the last update. important tool every responsible pilot should use. I've used there web site for about 6 months but the app is not even comparable. Real time wind speeds at every altitudes. (Just my favorite feature so far). Many, many more cool features. I've been searching for drone apps and never saw this one until typing uav. This has everything I was looking for and more! I was looking for a winds aloft app, this allows the altitude to be entered and it calculates Hourly wind estimates. I love the hourly GPS and solar storm prediction as well. I have mainly been using foreflight for winds aloft and TRFs. I combine this with the app "zone" to see where small helipads are as well. I'll buy a subscription to keep up the good work! Not all airports need a 5 mile radius. Once you close the app, all custom settings are lost. I'll be looking for an alternative. This is one to pass on. App very easy to use. Waited for something like this for a long time. Now I don't have to use the website. Puts a window up to touch to buy. Can't exit without hitting button which charges you 23.99. This app is theft! This app is simple and easy to use and understand. Updates every hour with weather and no flying zones, even temporary no flying zones, and with it the explanation why you can't fly there. This is THE best app if you are an owner of a UAV/Drone/quadcopter. With this app you always know when and where to fly!! Must have! 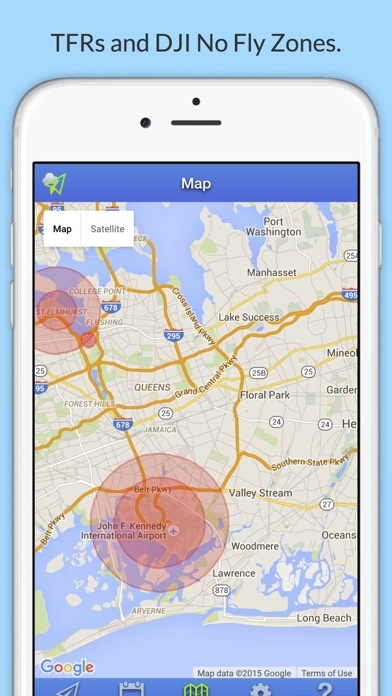 Great app with tons of features however the no fly zones are incorrect and do not always show up. Use a separate app for that. You can tell whoever made it put alot of time into it. Well done. Wish it had a option for non military time (12 hr). Warning: Do not buy the yearly subscription. I paid for a subscription on my iphone. It keeps asking me to pay again. I hit restore purchases and it crashes. This has been going on for months. The website will not send me an email to reset my password or let me log in. No way to contact them to rectify the issue. Stay away. I used and relied heavily on the web based version. Told many of my RC friends about it. Always found it to be very reliable and accurate and planned what days I'd be flying based on it. Very excited about the app version. Even better! Great app where you can set your limits and it will quickly inform you if you are outside those limits. But like any other weather report it is not all accurate. The support for this app is awesome, I emailed with an issue and shortly after I received a response with a fix. Since the last update on April 14th, 2017, the application will not load. What happened? This was a great app until this latest update. Don't bother to purchase until this issue is resolved. ----UPDATE---- As of Sunday, April 16th, the application is fully working. Revised my rating to 4.5 stars. Bug that said "Unable to fetch current conditions" is gone. App works great. Just what I needed. Now I don't have to use the computer to check. 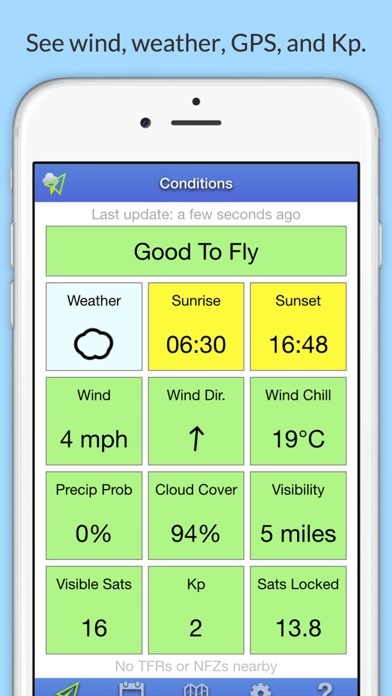 This is a very simple and accurate app to determine weather conditions before you fly. It's saved me multiple unnecessary trips in areas that were too windy or rainy. Highly recommended for any UAV flight. Do you guys even check the apps before posting the updates? After the last two updates, There is no data. I'm starting to lose faith in this app. So happy that the best UAV forecast and map app is on the iOS App Store. Shows exactly what you need to know for planning your UAV flights with the convenience of an app. No more needing to go to the website to check conditions. I had the app installed on two devices, on my iPad the wind was set at an altitude of 10m and on my iphone at 30m. Now, with the new wind profile this is redundant. What a brilliant, superb app. I love how you can set your conditions and the app will tell you if it's good to fly or not. I check it all the time. Only thing I would change is making the No Fly Zones to be 5 miles around airports instead of 3. I love the layout of this app! Except that today my ceiling is at 227' agl. UAV Forecast says I'm good to go. But I have to maintain 500' below that ceiling. I'm not good to go. That is a critical omission. The features it offers are great in terms of information covered is basically everything you could need to know before flying. However the app never figures out my location even after typing it in and that usually renders it useless. I love the thought put into this app for pilots, it just needs some fine tuning in order to work. I haven't experienced the charge window problem which I am hoping is simply a glitch and not a purposeful act. I am however afraid to log in since this was supposed to be a free app with the OPTION of an extended forecast and VIP type purchase plan, but it is automatically charging people for using it. Thanks for your listening ear. Safe flying everyone! Love the new wind profile tab, this is my most frequently referenced app for UAS operations. Long time users, many thanks to the dev for the nicely done app. Dead weight after last update. By far, this is the best UAV app I have seen so far. I was looking for something to forecast the weather, wind and also display the various no fly zones for drone flying. I have not found another app that will give you hour by hour details on flying conditions like this. App won't load since last update. Loved using the web service, now this app makes it even easier. Latest update brought location search, so you aren't limited to local information! This has always been my favorite app for UAV flying. I thought we lost it on iOS 9.3.5., but the last update fixed it. Kudos! Finally fix the 9.0 iOS issue. I'm so happy thank you. This is a nice all around app but....The wind gusts are nowhere as high as the app says. 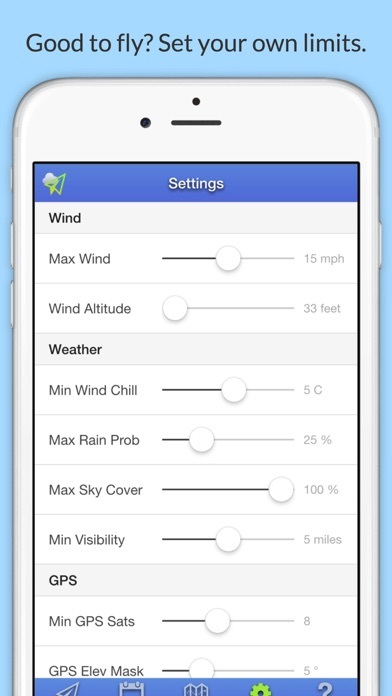 I purchased this app for correct wind conditions and it has let me down. Please fix this Matthew Loyd. It’s seems like a great idea, but...Since day one of installing the app, everyday and all days it says “not good to fly”.